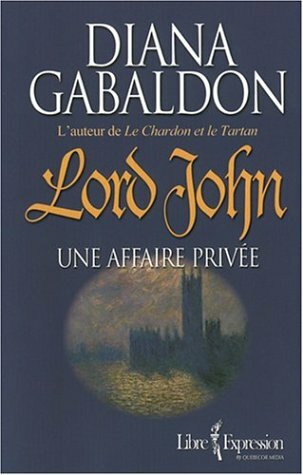 Includes a sneak preview of the next Outlander novel, A Breath of Snow and Ashes and a bonus tale: Lord John and the Hell-Fire Club Adored bestselling author Diana Gabaldon brings us the first book in a new trilogy featuring many of the characters from her wildly popular Outlander series. In her New York Times bestselling Outlander novels, Diana Gabaldon introduced millions Includes a sneak preview of the next Outlander novel, A Breath of Snow and Ashes and a bonus tale: Lord John and the Hell-Fire Club Adored bestselling author Diana Gabaldon brings us the first book in a new trilogy featuring many of the characters from her wildly popular Outlander series. In her New York Times bestselling Outlander novels, Diana Gabaldon introduced millions of readers to a dazzling world of history and adventure -- a world of vibrant settings and utterly unforgettable characters. Now one of these characters, Major Lord John Grey, opens the door to his own part of this world -- eighteenth-century London, a seething anthill of nobility and rabble peopled by soldiers and spies, whores and dukes. Great Britain is battling France for supremacy on three continents -- and life is good for a soldier. The year is 1757. On a clear morning in mid-June, Lord John Grey emerges from London’s Beefsteak Club, his mind in turmoil. A nobleman and a high-ranking officer in His Majesty’s Army, Grey has just witnessed something shocking. But his efforts to avoid a scandal that might destroy his family are interrupted by something still more urgent: the Crown appoints him to investigate the brutal murder of a comrade in arms, who may have been a traitor. Obliged to pursue two inquiries at once, Major Grey finds himself ensnared in a web of treachery and betrayal that touches every stratum of English society -- and threatens all he holds dear. From the bawdy houses of London’s night-world to the stately drawing rooms of the nobility, and from the blood of a murdered corpse to the thundering seas ruled by the majestic fleet of the East India Company, Lord John pursues the elusive trails of a vanishing footman and a woman in green velvet, who may hold the key to everything -- or nothing. The early days of the Seven Years War come brilliantly to life in this historical mystery by an author whose unique and compelling storytelling has engrossed millions of readers worldwide.